This animated feature is set in the Wild West and focuses on a chameleon (voiced by Johnny Depp). This little creature considers himself an actor and tries to put on performances with inanimate objects in his glass tank. After somehow breaking out, he's left to contend with the perils of the desert. Escaping the dangers of a hawk, the chameleon takes refuge with another lizard named Beans (Isla Fisher) who is heading back to her town of Dirt. When he arrives there himself, he finds that the town is continuously suspicious of outsiders. This is primarily because the town's water supplies are so low - there's barely enough to last for the next six days. To prove himself to his sceptics, the chameleon pretends to be a fierce outlaw, telling tales about his heroics. Winning the respect of the people, the chameleon calls himself Rango and is made the sheriff of Dirt. But the ambiguity surrounding Dirt's Mayor (Ned Beatty) and his stranglehold on the remaining water supply remains. 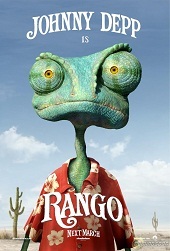 Rango compensates for some familiar tropes and situations with a superior visual style and an expressive voice cast. Gore Verbinski's film is foremost a parody of the Western genre and it borrows heavily from the Chevy Chase spoof iThree Amigos! That film, itself a take on The Magnificent Seven itself, was also about a group of actors who entered a village and were mistaken for real gunslingers. I suspect there's a more contemporary political message running throughout Rango, though. The town of Dirt lives off the idea of hope for a better future. But for a sheriff promising stability, Rango is reliably destructive and irresponsible, failing to keep order. Then there's the town's necessity for a precious resource, overshadowed by a tyrannical prospector. These political undertones are contained in a relatively foreseeable and familiar narrative, working with a common idea of so many animated pictures that the smallest person can make a difference. Nonetheless, the film rides high on an abundance of charm, provided by its inventive and textured visuals. The tone of the film remains light and playful but the visuals distinguish themselves from highly saturated pictures like Tangled and Toy Story 3, with grittier palettes. The arid, sunburnt planes are naturally fitting for a Western and the film compliments this hardened tone with equally dark character models too. There's more of an edge to the design of these characters because many of them are halfway between being anthropomorphic and more grotesque creatures. Abigail Breslin's Priscilla is for example a walking and talking rat. But she's also dressed like a school girl, with plaits, not unlike Hailee Steinfeld's character from True Grit. It's particularly funny how they resemble token characters from the Western genre too. It gives a unique but also more unsettling feel to the town, fitting of Rango's experience as an outsider. Adults will enjoy picking up on these genre references (among them Chinatown and Sergio Leone's Dollars Trilogy). Thankfully, the film is also often witty, courtesy of a clever script by John Logan, working from a story heco-written with Verbinski and James Byrkit. The slapstick action, moving from elaborate set pieces to more subtle visual gags, is equally humorous and beautiful, and is slickly controlled by Verbinski (fresh from his experience on the three Pirates films). The voice cast is even more impressive. The enthusiastic line-up includes Johnny Depp, Abigail Breslin, Ray Winstone and Bill Nighy as a very creepy snake, and they're all excellent. Even the supporting players give memorable life to even the smallest character. A lot of publicity has been given to the preparation of the voice work, specifically using the voice actors to act out the scenes themselves. Given the near-perfection of how Depp captures Rango's clumsiness, I would say that this technique has been a great success in drawing the actors closer to the scenarios and providing them with a greater understanding of their characters mannerisms.